"Thanhouser Japanese silent film, 1912"
Thanhouser Company; Silent films; Takagi, Taku; Garwood, William; Snow, Marguerite; Barnes, Justus D.
Production still from Thanhouser Company's Japanese series "Miss Tagu of Tokio" 1912. 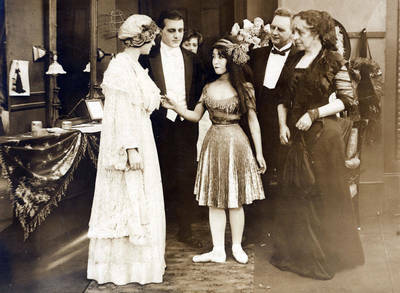 Taku Takagi in ballet costume, William Garwood stands at her side and Marguerite Snow is at the left. Justus D. Barnes is second from the right. BW photograph; 4.5" x 6.25"